Every year for Christmas, my mother will get us something. Some times it's something really cool, some times it's something really stupid. Well, this year was a really cool year! 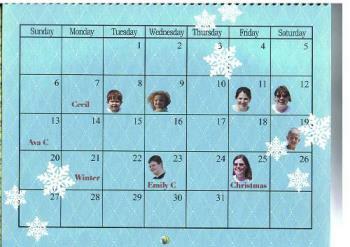 My mom made us calendars for 2009. The front cover is in a pattern with our favorite color and has our name and the year on it. Then each month has a picture on it that has to do with that month. They're all pictures of something we know. Like January is a picture of the trees in my mother's yard during an ice storm we had a while back. For June, it's the local High School with pictures of the 3 kids that will be graduating this year (although not all from that school). May has some pictures from our last year's Memorial Day party and August has pictures from the Labor Day party last year. Every month is marked with something to do with our family from that month. AND, this is the great part, throughout the year, ALL of our living relatives birthdays are marked and most of them with their picture. If she had a picture of them, from a reunion or a visit, she put it on their birthday. Now, I don't normally use a calendar and I probably wont use this one. But, I will keep it forever! I think she said she did most of it through epson.com??? I am so not creative like that so I have no clue. No, I did not originally post a pic of it, because I don't normally post pics that have actual people in it. But, here is what next December looks like! As you can see, my birthday will be on a Friday next year!!! That is really cool! You must have a huge family! All those people have birthdays and that is only one month! You look great in that pic! A Christmas baby! Wow! Now what could that mean? We only have one month where we have NO birthdays - I think it was May??? The least amount was 3 for a month and I think July was the biggest month. I do have a huge family... There were 4 aunts and uncles, they all had from 5 (our family) to 3 kids, and most of that genertion has kids, with a few on the next generation. Most of that is from my Mom - if we don't show up at a funtion it looks like no one's there! What a wonderful present and something to treasure for ever,sounds like she got it right this year. That's really cool! Did you tell your mother you liked it? I bet she would feel really good. Now you will never forget what has happened in the past, or any of your relative's birthdays! Both me and my sister opened them at the same time. We were like "WAY COOL MOM!!!" Most of the day was spent looking through them and having the younger kids ask who everyone was. It was great!! !